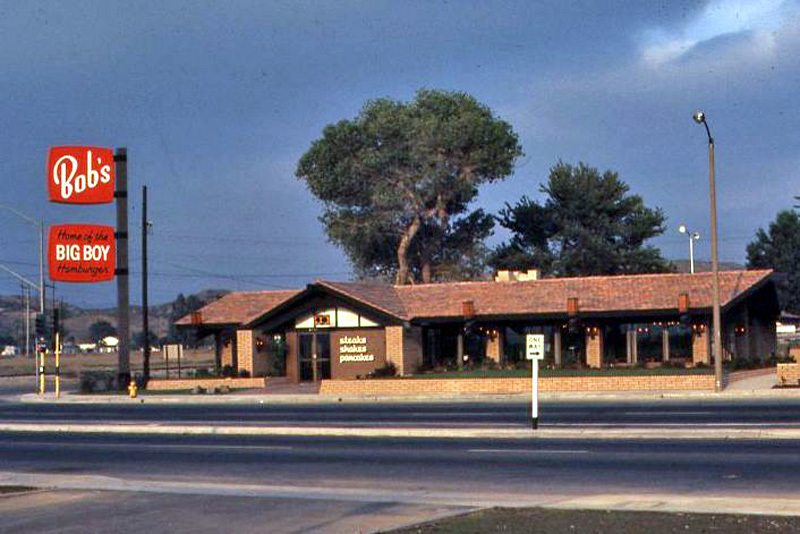 Bob's Big Boy Restaurant in Valencia, shortly after it opened in 1972 at 23701 W. Valencia Blvd. (southeast corner of Valencia and Magic Mountain Parkway). Unlike Bob's Big Boy restaurants elsewhere, this one didn't have the iconic Big Boy sculpture out front. That was no accident. The landowner, The Newhall Land and Farming Co., wouldn't allow it because it didn't fit with the company's vision of Valencia; company offiicals thought it would look too "San Fernando Valley." It was almost a deal-breaker, according to a source close to the company, but the restaurant chain relented and placed the sculpture inside the building. TN7201: 19200 dpi jpeg from smaller jpeg.